IL-6 is a pleiotropic cytokine involved in both the initiation and the maintenance of the inflammatory and immunologic responses in certain autoimmune diseases. Blocking of these two complementary functions of IL-6 may confer additive, or even unique, benefits to the patient. The levels of both IL-6 and its soluble receptor (sIL-6Rα) are elevated to various degrees in many rheumatic diseases. IL-6 blockade has been shown to be beneficial both in experimental models and in human disease, and inhibition of IL-6 signaling with a molecule such as tocilizumab could prevent or reverse some of the complications typically associated with rheumatic diseases. Interleukin (IL)-6 is a pleiotropic cytokine that has actions on a host of biologic systems. Because of the broad spectrum of activities, it has been suggested that IL-6 may contribute to the pathophysiology of inflammatory arthritis. High levels of IL-6 are produced in the joints of patients with rheumatoid arthritis (RA), and large quantities can be detected in their serum. These findings have contributed to the view that increased secretion of IL-6 may be responsible for local and systemic signs and symptoms in patients with RA. IL-6 acts as a stimulator of both B and T cell functions and also promotes proliferation of plasmablasts during their final stages of maturation into immunoglobulin producing plasma cells . Based on its multiple stimulatory effects on cells of the immune system, as well as on vascular endothelial cells, osteoclasts and synovial fibroblasts, it is believed its excess plays a pathogenic role in the development of the inflammatory manifestations of RA. In this regard, IL-6, in conjunction with the soluble IL-6 receptor (sIL-6Rα), has been shown to activate endothelial cell production of a subset of chemokines and to upregulate expression of adhesion molecules, thereby contributing directly to recruitment of leukocytes at inflammatory sites . In addition, IL-6 can stimulate synoviocyte proliferation  and osteoclast maturation and activation , therefore suggesting a role in synovial pannus formation and in bone resorption in inflamed joints. IL-6 is also known to be an endogenous pyrogen  and is the major cytokine inducer of acute phase response genes . Because of this panoply of activities, IL-6 is thought to play a critical role in synovial and systemic inflammation in RA. Genetically manipulated mice have been useful in identifying the role of specific cytokines in models of human disease. In most circumstances, ablation of a single cytokine is compatible with normal life , affording the opportunity to examine the role of that specific cytokine in disease pathogenesis. There are data from a large range of rodent models of arthritis suggesting that enhanced production of IL-6 is characteristic of inflammatory arthritis in mice . Collagen induced arthritis (CIA) is a murine model of human inflammatory arthritis that is associated with increased production of IL-6. In comparison with wild-type mice, IL-6 knockout mice were completely protected from CIA, clearly indicating the central role of IL-6 in this model. Protection was associated with reduced antibody response to type II collagen and absence of inflammatory cells and tissue damage in knee joints . CIA was fully restored to IL-6 knockout mice by administration of a combination of IL-6 and its soluble receptor. Notably, intra-articular administration of IL-6 itself was insufficient to reconstitute arthritis in these mice. However, a sIL-6Rα/IL-6 fusion protein reconstituted disease activity . This finding is explained by the observation that many cells within the inflamed joint do not express the transmembrane IL-6R, but they can be stimulated by an IL-6/IL-6R complex that can interact with the signalling portion of the IL-6R, gp130 (CD130), which is expressed by all cells. Importantly, although high IL-6 concentrations have been documented in serum and synovial fluids of patients with various arthritides, cell types resident to the joint (chondrocytes, synoviocytes, fibroblasts and endothelial cells) lack expression of IL-6R . Consequently, these cells are unresponsive to IL-6 itself. IL-6 complexed to its soluble receptor may therefore represent the major mechanism by which IL-6 elicits its effect during arthritis. Analyses of synovial fluid from arthritic patients have shown that increases in sIL-6Rα correlate with the extent of joint destruction and correspond to more advanced stages of RA [3, 12]. In this respect, in vitro studies have implicated involvement of sIL-6Rα in synovial proliferation, bone resorption and other inflammatory processes [3, 12]. Results from studies of murine models support the conclusion that IL-6 is a promising target for effective therapeutic intervention in RA. A study by Takagi and coworkers  reported findings supporting this conclusion; they found that the rat anti-mouse IL-6 receptor (anti-IL-6R) monoclonal antibody MR16-1 significantly reduced the development of CIA by suppressing IL-6 signal transduction. Murine monoclonal antibodies are not suitable for development as therapeutic agents in humans because of their short half-lives and the probable development of neutralizing antibodies due to the immunogenicity of the mouse protein. As a result, a humanized anti-IL-6 receptor monoclonal antibody, tocilizumab, was developed in a collaboration between the Chugai Pharmaceutical Co., Ltd (Tokyo, Japan; now a member of the F Hoffmann-La Roche Ltd Group) and the Medical Research Council Collaborative Centre (London, UK) [14, 15]. This antibody was previously referred to as MRA. As proof of principle, in an examination of the impact of tocilizumab on CIA in cynomolgus monkeys, blocking the activity of IL-6 with tocilizumab suppressed CIA, inhibiting clinical, histological and radiographic manifestations of joint damage . As discussed above, there is considerable evidence that IL-6 plays an important role in rheumatoid inflammation. For example, serum IL-6 levels are dramatically elevated in RA patients, and this elevation can be directly correlated with clinical and laboratory indices of disease activity, such as C-reactive protein (CRP) . Therefore, the impact of tocilizumab in RA patients was examined in a phase I/II randomized, double blind, placebo controlled, single dose escalation trial . Disease modifying antirheumatic drugs were withdrawn from patients enrolled in the study for 1 month before tocilizumab treatment. The primary end-point of the study was American College of Rheumatology (ACR)20 response. 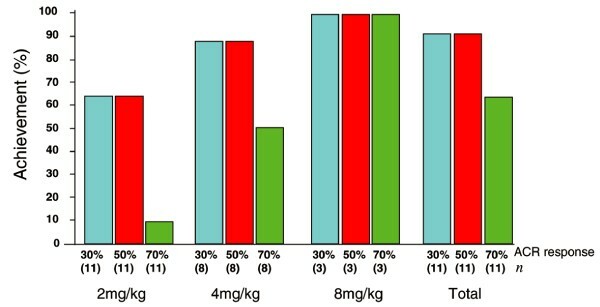 As shown in Figure 1, at the higher doses of tocilizumab 50% of patients achieved an ACR20 response within 2 weeks. 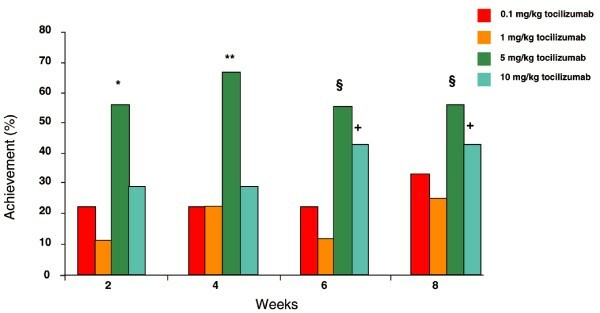 Responses from a single dose of tocilizumab in the absence of concomitant disease modifying antirheumatic drugs were sustained for about 8 weeks following administration. Sustained ACR20 response to treatment with tocilizumab. ACR, American College of Rheumatology. *P = 0.023, **P = 0.002, §P = 0.008, and †P = 0.043 versus placebo. Reprinted, with permission, from . Copyright © 2002 American College of Rheumatology. IL-6 blockade also appears to be efficacious in systemic onset juvenile idiopathic arthritis (sJIA). Recently, data were reported from a dose escalation trial conducted in children with sJIA in which the administered dose was increased from 2 mg/kg to 4 mg/kg to 8 mg/kg given twice a month . At 2 mg/kg there was a good response, as measured by the JIA core set of improvement criteria, with 60% of patients achieving 30% and 50% responses. When all the doses were combined, more than 60% of patients achieved a 70% response, which is indicative of the capacity of tocilizumab to confer significant benefit in patients with sJIA (Figure 2). Therapeutic efficacy of blocking IL-6 activity in sJIA. IL, interleukin; sJIA, systemic onset juvenile idiopathic arthritis. Reprinted, with permission, from . Copyright © 2005 American College of Rheumatology. Apart from controlling the signs and symptoms of inflammatory arthritis, blockade of IL-6R signalling also exerted a positive effect on a number of other manifestations of these conditions. For example, in chronic diseases characterized by increases in IL-6, a clear association with anaemia has been shown . In this regard, a negative correlation between IL-6 and haemoglobin levels was reported in the geriatric syndrome of frailty . The inverse correlation between IL-6 and haemoglobin levels was not thought to be related to iron deficiency . Notably, in experimental animal and human clinical studies, administration of IL-6 was associated with the development of anaemia. Thus, treatment of patients with cancer with IL-6 has led to a rapid decrease in haemoglobin concentrations , and administration of IL-6 to rhesus monkeys correlated with a decline in packed cell volume . These studies support the link between a chronic increase in IL-6 and development of anaemia. One possible explanation for this finding relates to the action of the acute phase reactant, hepcidin, which is produced by the liver in response to IL-6 . Hepcidin exerts a dual effect in that it interferes with the release of iron from macrophages and interferes with iron absorption. It is thought to be a central determinant of the development of anaemia in chronic disease. That upregulation of hepcidin is driven by IL-6 in inflammation was demonstrated in vivo in experiments comparing the responses of wild-type and IL-6 knockout mice . Mice challenged with an inflammatory stimulus exhibited a dramatic increase in hepatic hepcidin mRNA and a decline in serum iron, whereas these responses were absent in IL-6 knockout mice. In diseases such as Castleman's disease, normalization of IL-6 levels is paralleled by resolution of anaemia . This was also observed in RA and sJIA patients treated with tocilizumab [27, 28]. In a multicentre, randomized clinical trial in patients with established RA using multiple doses of tocilizumab – the CHARISMA study (Chugai Humanized Anti-human Recombinant Interleukin Six Monoclonal Antibody)  – anaemia resolved within 2 weeks of administration of tocilizumab. This demonstrates that overproduction of IL-6 contributes directly to the development of chronic anaemia and that, by blocking the IL-6R, this can be reversed. Another potential benefit of IL-6 blockade relates to the effect of IL-6 on bone metabolism. Patients affected by RA and sJIA often have systemic osteoporosis, independent of cortico-steroid treatment . Young sJIA patients are characterized by stunted growth, and preliminary clinical studies using tocilizumab in these patients have demonstrated significant improvement in patient height, leading to catch-up growth . Bone abnormalities occur in diseases characterized by high levels of IL-6 because IL-6 has pro-osteoclastic activity and may also influence bone resorption . IL-6 has also been speculated to play an important role in the development of coronary artery disease through a number of metabolic, endothelial and procoagulant mechanisms [31, 32]. Prospective studies of apparently healthy and high-risk individuals indicate that increased levels of IL-6 [33, 34] and CRP [35, 36] – a surrogate of IL-6 levels – are predictors of cardiovascular mortality  and future myocardial infarction . Substantive interrelationships of circulating IL-6, CRP and traditional risk factors have been described in women . The IL-6 level has been demonstrated to be a strong independent marker of increased mortality in unstable coronary artery disease and identifies patients who benefit most from a strategy of early invasive management . Although hypothetical, there is reason to suggest that blockade of the IL-6 signalling pathway in patients with inflammatory diseases characterized by IL-6 overproduction may be of benefit to patients that have a very high risk for coronary artery disease. Overall, it has been demonstrated that IL-6 is a major contributor to the pathophysiology of inflammatory arthritis, including RA and sJIA. Because of the central role played by IL-6 in a number of manifestations of these inflammatory diseases, IL-6 is a candidate target for therapeutic inhibition as a novel approach to the treatment of RA, sJIA and perhaps other related rheumatic diseases. IL-6 blockade has been shown to be beneficial both in experimental models and in human disease, and inhibition of IL-6 signalling with a molecule such as tocilizumab could prevent or reverse some of the complications typically associated with rheumatic diseases. Additional studies will establish the role of tocilizumab in therapy for rheumatic diseases.